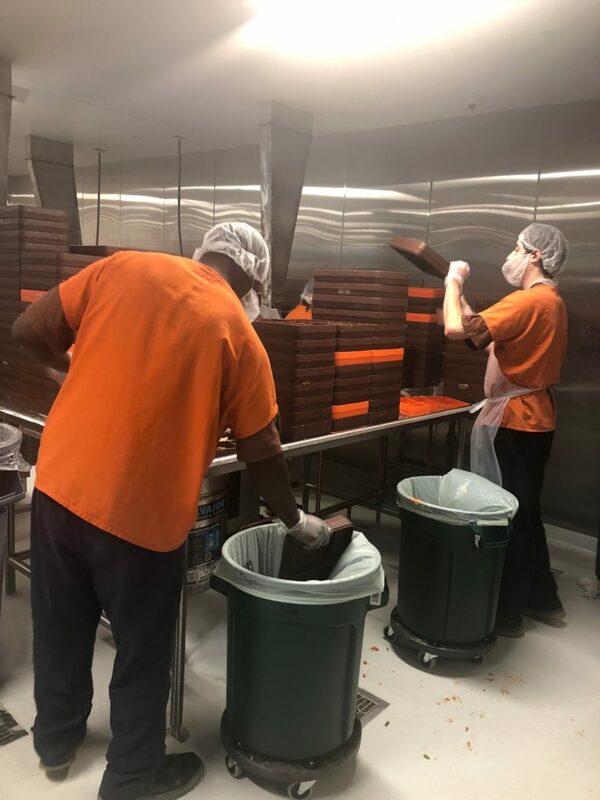 In September 2018, the newly remodeled kitchen at Lake County Adult Corrections Facility opened, and with it launched a new food scrap composting system. With two full months up and running, what does this mean for the jail? Much less garbage! 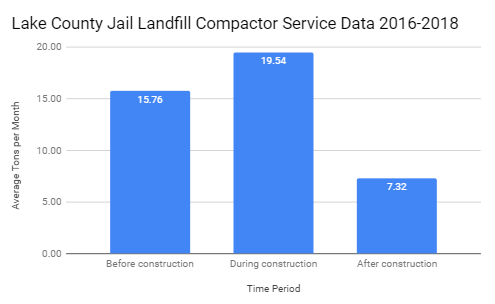 The garbage compactor used to be picked up one to two times a week and the jail was sending an average of 15.76 tons per month to the landfill. The new program brought a new dumpster to the jail to collect food scraps from the inmate meal service. The food scraps are taken to a compost processor to become valuable nutrients for soil. The garbage compactor is now picked up every three weeks, and the jail is sending an average of only 5.12 tons per month to the landfill. So what does this mean in terms of impact? 10.64 tons of material are now being composted and recycled rather than thrown away. That is equal to 20.75 metric tons/month of avoided CO2 emission, or taking 53.75 cars off the road. 125 tons of material are now being composted and recycled rather than thrown away. That is equal to 243.75 metric tons/month of avoided CO2 emission, or taking 631.48 cars off the road. Lake County Adult Corrections Facility has an ambitious and attainable goal of diverting 75 percent of its waste from the landfill through this composting and recycling program. Stay tuned for future stories on this program about how inmates are involved, how spoons make a difference and where old inmate uniforms go. Photo: Seven Generations Ahead and Solid Waste Agency of Lake County work with inmate kitchen workers to conduct a waste audit at the Jail. Image: Garbage from the Lake County Jail drops significantly after start of composting and recycling and program. Over half the garbage eliminated. 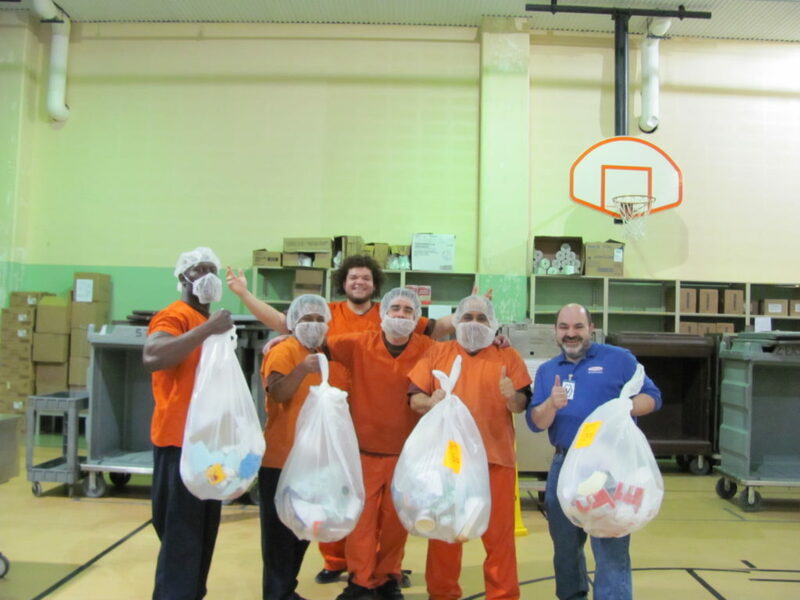 Photo: Inmate kitchen workers at the Jail sort food scraps for compost from garbage on the tray wash line.